The Cookery School scene is going from strength to strength with Chefs putting in phenomenal efforts to produce some outstanding results. Stainless Fabrication for Domestic, Semi Professional and Cookschool Kitchens are both practical and stylish and R H Morton has done some of the best. From working with Scottish TV Chef Nick Nairn not once, but twice at both his great Cookery Schools at Lake of Monteith and Aberdeen, to a demonstration kitchen for Masterchef George McIvor when he was with Baxters, MD Judith Tatham went on to work with Architects to collaborate in some exceptional bespoke domestic kitchens. The company has long manufactured specialised worktops, sinks, splashbacks and ventilation canopies for some of the top international kitchen suppliers, and directly to large country houses. They also service and repair LaCanche domestic ranges. 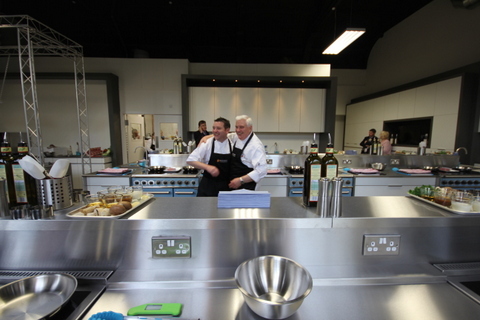 When R H Morton had a call to collaborate on another facility for Nick Nairn, they worked with Kitchens International to design not only the main teaching area on the first floor, but some different hands-on training stations by the shop on the ground floor, including a "Rise and Fall" ceramic hob to accommodate wheel chair users.